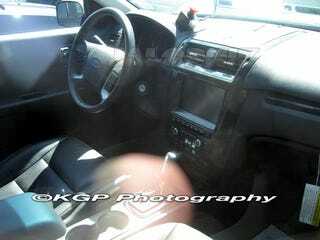 Looks like we've finally got interior photos of the 2010 Ford Fusion to go with the happy, smiley exterior. When the KGP photographers snuck up on the Fusion they noticed that, other than the general dash layout, the new Fusion is getting a gigantic LCD screen in the center stack with new air vents. Not surprisingly, the old-fashioned time-piece from the previous generation was ditched in order to maintain Ford's new SYNC-fueled tech frenzy. If you want to switch on the A/C you're going to have to reach lower now that the screen is taking up all that space. Spy report below the jump. the center stack, beneath the large screen. are clearly part of the package. has little more to offer.